Hello All! Welcome to our Tea Cup Tuesday! Martha and I share a love of tea cups, and really, all things tea. We totally love coming and seeing your beautiful tea cups each week and so you have all blessed us! 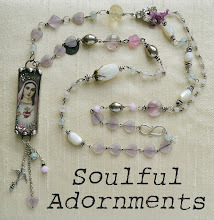 Isn't it delightful to focus on things that bring you in touch with your own inner joy? I think so! Tea cups and having tea are pure delight to me. Sharing it with Martha and you all???? PRICELESS! I owe the showing of today's cup to Carrie at Oak Rise Cottage who shared her Lady Carlyle tea cups last week and reminded me of mine and how much I enjoy it. She showed both the Avon shape as well as the Malvern. My cup is the Malvern shape although I love the Avon more. As you can see it is a cup full of gorgeous color! It sits pretty on it's pedestal base simple adorned with two gold rings. These pretty flowers adorn the inner cup. I find the plate a work of art! Just look at that pattern! Of course, it is Royal Albert! Doesn't it just look like a Royal Albert cup? The pattern name "Lady Carlyle" is perfect for it. 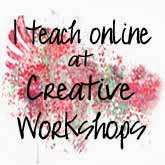 I never knew I would be teaching classes online, and I know I am going to love it! 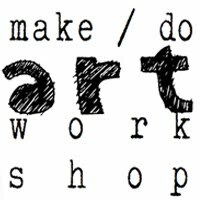 I know some of you have signed up and I am so excited to have the opportunity to create with you! 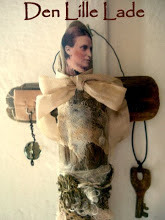 Click here to enter my giveaway of a Domino kit I put together from my own art stash! I must say, I am feeling a little guilty for having a video that isn't free, after two and a half years of free only! Someone commented on my Youtube page that they were sad I wasn't having free ones anymore. But I am ! I will do more for free. I love doing that too! This vase of flowers looks so lovely! The weather has cooled here some, and the roses are much happier! We will have roses for another month before it gets cooler. Flowers are such a gift! They too connect me with my JOY! Thank you so much for stopping by for a visit today! Martha and I would love for you to join in, just pick out a tea cup to share and tell us about it in a post. Then come back here and sign up with Linky Tools below. 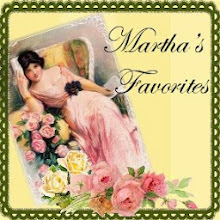 If you don't have a tea cup, you could go look at Martha's website Pretty Vintage Things, she sells beautiful tea cups! What a stunning photo of the tea cup with the roses at the top! 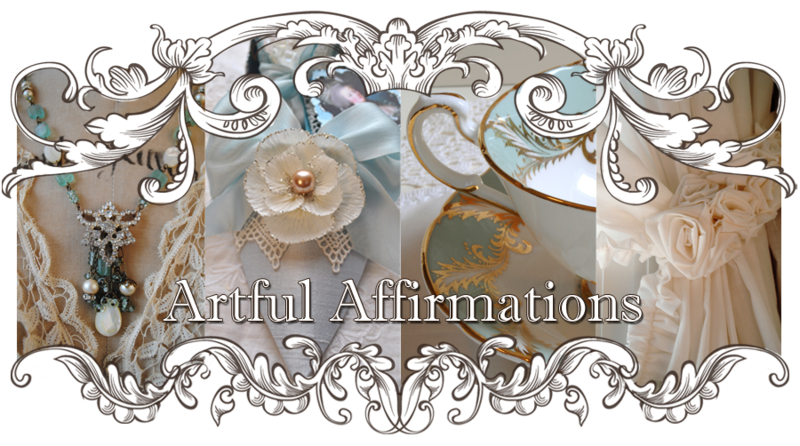 Hi Terri - Love your Lady Carlyle teacup, a work of art indeed! Speaking of work of art, congrats on your new endeavor...what better way to show your talent and share it with everyone who wants to learn. You're an inspiration! 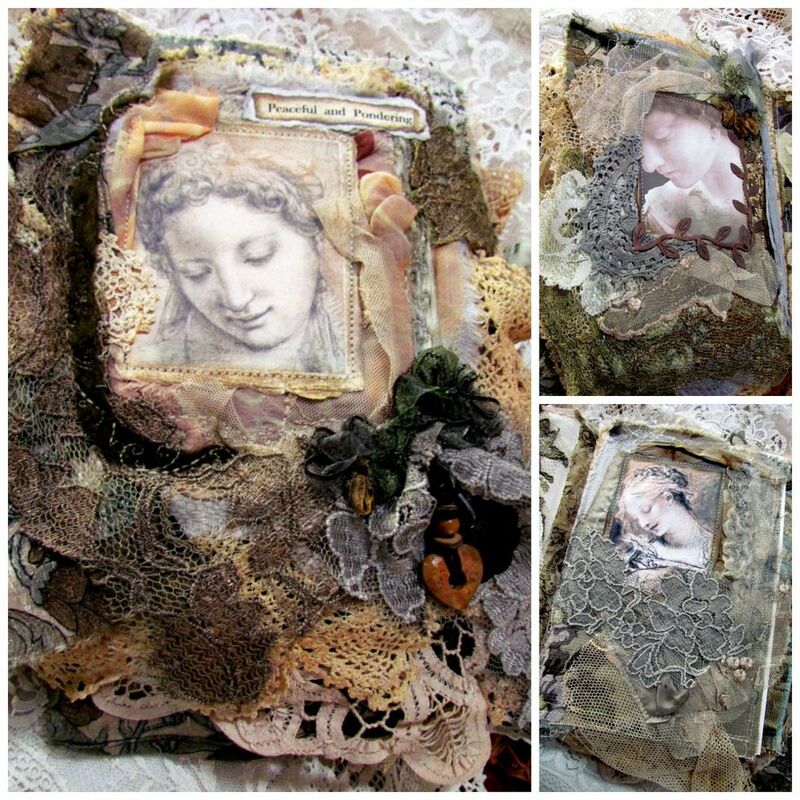 Terri, may I use the very top image in a watercolor? I will give you credit via name, links etc. It is the perfect composition and just stunning and inspiring!! As always, you share today a wonderful cup. 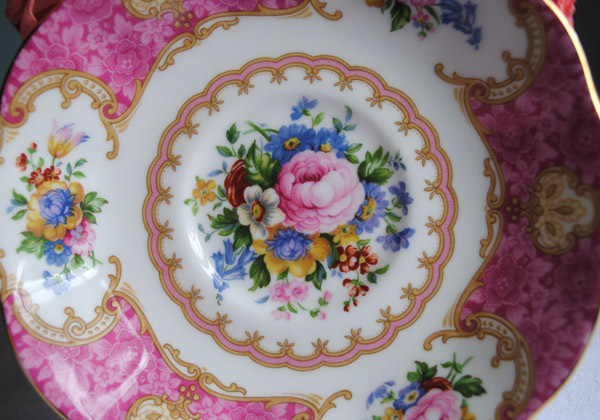 Royal Albert is really one of the maker with the most beautiful patterns. 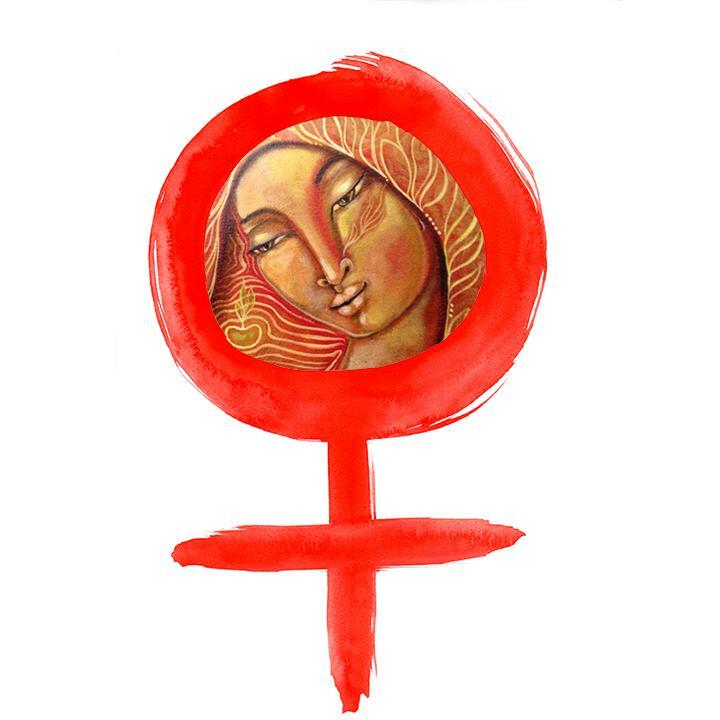 And both shapes are feminine and elegant. Alas, there is from Royal Albert in Germany only a few patterns listed. Your domino kit looks nice and one who can make those little books will be very happy. I have seen in former times some of your videos. But I have the problem that I can't hear the sound, because my computer has a problem. So it is difficult to understand. Wish you lots of fun and success with your classes. Love the intro video, your mini books, looks so beautiful- and so do you dear. Helo, I can't believe it, this cup is the cup of my neighbour/friend!Everytime when I drink coffee at hers (in France you can drink coffee in a teacup) it is in a cup likle that, isn't that funny! 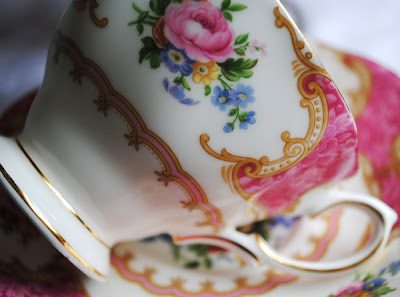 I simply adore the Lady Carlye teacup. Eventhough I have lots of beautiful teacups in my collection, I'm always drawn to this cup. It really is a work of art! Your fresh roses are so beautiful! 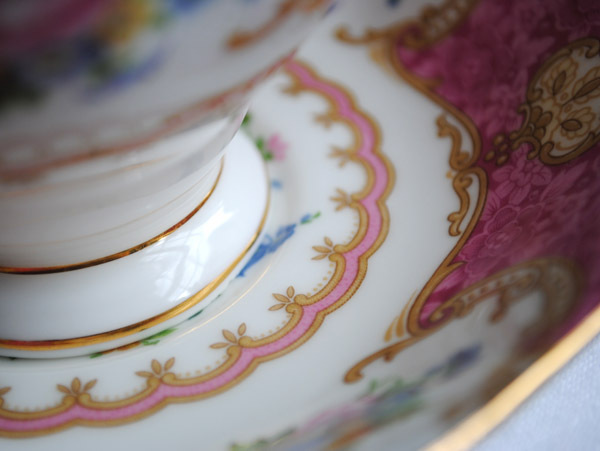 Your Lady Carlyle teacup is beautiful. I love the pretty pink color and pattern. Sipping from a Lady Carlyle cup at The Old Curiosity Tea Shop made my July tea there even more special. 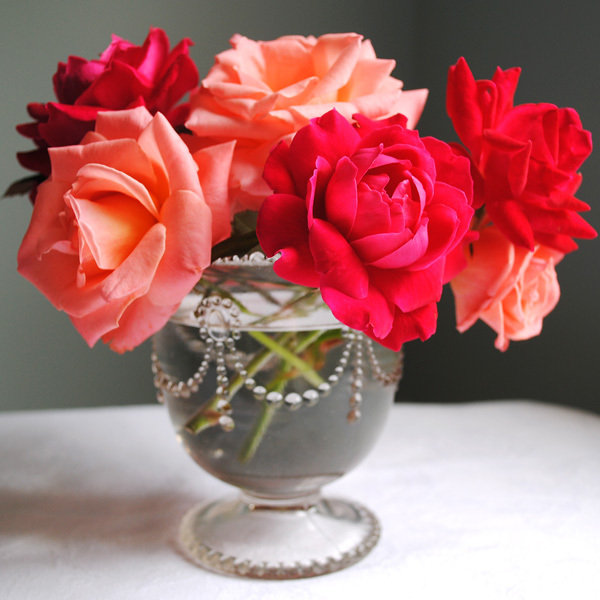 That pretty glass vase is perfect with those gorgeous roses from your garden. Thanks for the link to Creative Workshops - your class looks great! Terri, your Lady Carlyle cup is definitely a work of art. Just lovely. Congratulations on your class. Exciting times! Happy Tea Day! Thank you for having us over! These are just lovely pictures of that cup! Terri, I adore that pattern but I do not have a piece of it. I do keep my eye open for it. It is lovely and thank you for sharing its prettiness with us today. What a lovely cup! I adore the mini flowers on the inside, there is just something so wonderful about drinking your tea out of something that has touched such delicate art. Now I am off to make some tea on this rather dreary rainy day. Wish I had the lovely cup you shared to drink it out of. All of that beautiful floral detail is what brings out the artist in me...it makes me want to go straight into my studio...and start painting something pretty! maybe that's why I collect tea cups to begin with? who knows why the passion is there, it's just a good thing that it is! am I right, or am I right! congratulations on taking the step toward online classes....I am not yet brave enough to teach online...you are an inspiration! Your teacup is gorgeous. And the roses are so lovely. How nice to see you in the video. The complete collection should be precious! Gorgeous Terri...I love that one and have admired that cup from afar..very beautiful!! Congrats on everything and all that you are creating..you are wonderful..shine on! !I am very happy and thrilled for you my friend! What a beautiful teacup, Terri! Such gorgeous detail. Good luck with your class! You are so talented that I'm sure it will be a success. 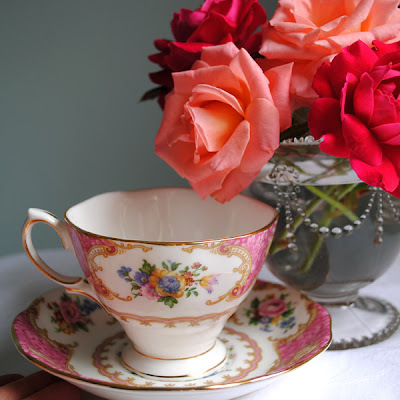 Gorgeous teacup, and gorgeous roses--your photos are beautiful! A very lovely teacup. I really love those colors. Hi Terri! I wanted to stop by and let you know you won my Gypsy giveaway. If you email me your address I will get it on it's way to you. Congratulations! A lovely post Terri! My wedding china is Royal Albert, I will be sharing that one post coming up. Your tutorials are marvelous, I will be checking out your class! 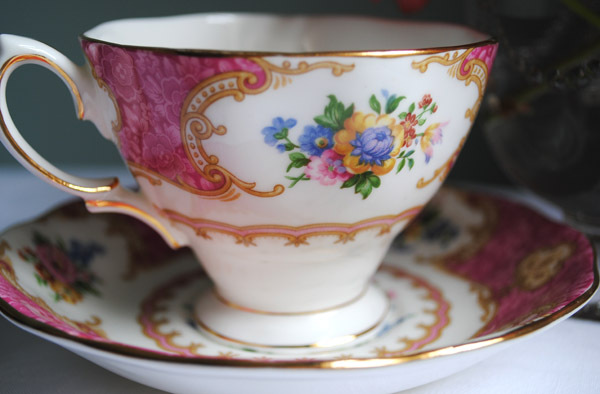 What a lovely Lady Carlyle teacup! I adore the pattern and color especially! (I have a little salad plate in that pattern, yet alas no teacup).., I display the plate on a stand in my office, where it sits ever so prettily on my desk. Congrats and best of luck on your new endeavor! 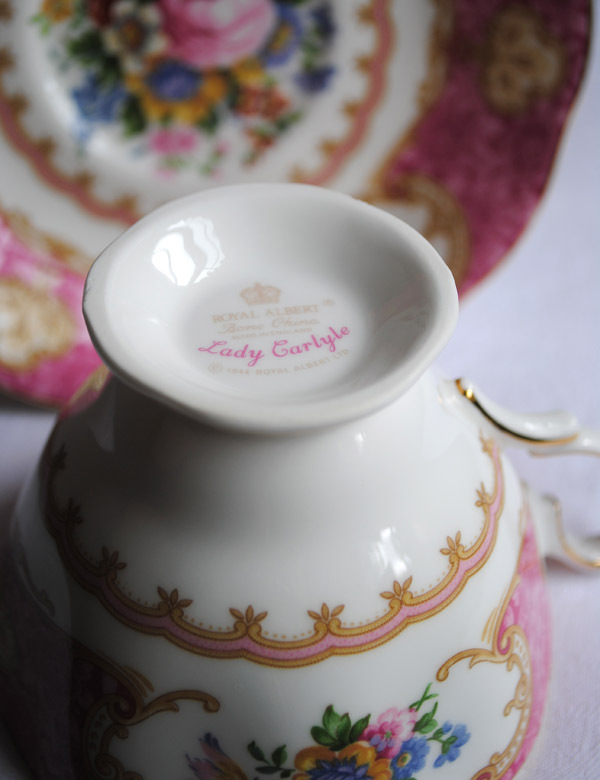 Thanks for sharing this lovely Lady Carlyle tea cup. It's one more beauty among all the gorgeous tea cups you own. Thanks for the visit and the follow. I am now following you! 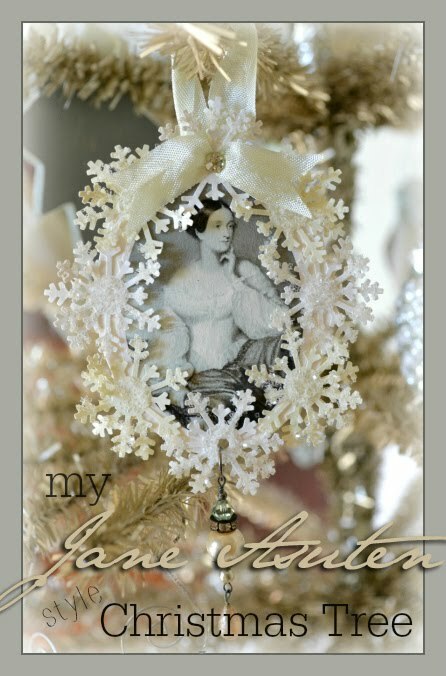 I love Lady Carlyle...so pretty! Your teacup is beautiful. I love how rich and vibrant the colors are. Each color and detail stand out. Thank you for hosting and have a lovely week. This has to be one of my favorite teacups I've ever seen. WOW! 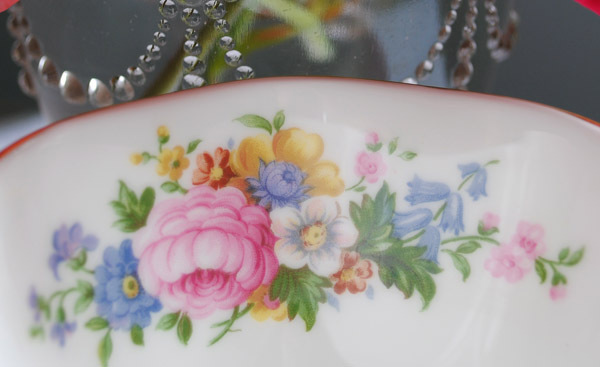 The Lady Carlyle cup/saucer is so beautiful! I agree that the bouquet pink and blues go so prettily together. And the blue foxglove inside the cup flouncing their pretty heads seem to quietly announce 'I'm here, I'm here". What a beautiful tea cup!! I love the pattern and colors. One of my dreams is to take china painting classes...I just love floral pattern china. Terri, You've given a very informative presentation of one of my favorite teacups! Tea Cup Tuesday-New Cup and New Tea Pot!